The miracle of motherhood is eloquently expressed when observing how perfectly the female body is designed to conceive, birth, and nurture a child. Following conception, a woman and her unborn baby unite in an oceanic blend of energy and identity. Where one ends and the other begins no one knows (see Figure 1). Figure 1: Following conception, a woman and her unborn child unite in an organic blend of energy and identity. Where one ends and another begins no one knows. However, there does appear to be an innate wisdom that uses the nervous system as a conduit to transmit electrical impulses of intelligence to all the body’s systems that maintains mother and fetus in a state of homeostasis and balance. Regrettably, mechanical pressure on the central nervous system by distorted cranial bones and spinal structures can interfere with the normal transmission of this vital intelligence. Since all of the mother’s systems and organs are now providing for two, it is obvious that optimal posture and functioning is critical for the baby’s healthy development. 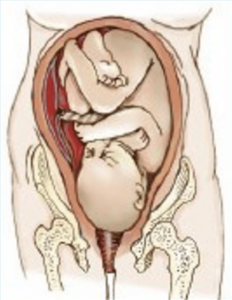 Figure 2: In the left fetal lie configuration, the baby’s head is inferior, flexed and rotated left with arms and legs curled to accommodate restrictions in the uterine cavity. Adapted from Bill Allen with permission. We begin our adventure into motherhood by introducing some very intriguing theories detailing how third trimester fetal positioning in momma’s womb may create aberrant adult postural patterns seen daily in our offices and clinics. Basic hands-on pelvic balancing and trunk stabilization routines taken from my Advanced Myoskeletal Techniques textbook are also included so therapists can aid expectant mothers in their quest for a healthy happy delivery. But before introducing the various postural theories and techniques, a brief overview of Mother Nature’s remarkable art of birthing requires thoughtful consideration. Figure 3: Fascial Bias in the Fetus and the Adult. Illustrated by Laura Moaske LLC. Reprinted with permission. The embryo enters the mother’s pelvis in what is medically termed a left occiput anterior (LOA) or left fetal lie position. The baby usually remains in this “normal” primary fetal posture throughout labor and delivery although a variety of movements are common throughout the entire birthing process. In the left fetal lie configuration, the baby’s head is inferior, flexed and rotated left with arms and legs curled to accommodate restrictions in the uterine cavity. Figure 2 illustrates a typical vertex positioned baby with head turned left. The small figure on the right shows the left occipital ridge resting comfortably on the mother’s pubic bone. However, as the embryo begins normal rotational movements in momma’s womb, the left side of the head will eventually face posteriorly. The most compact profile for the fetus is for the arms and legs to curl in opposing directions with a resultant rotation along a longitudinal axis. Some authors including Ida Rolf, PhD, J. Gordon Zink, DO, and Fred H. Previc, PhD1,2,3 have found this rotational fascial bias to be an important factor in determining the final shape of the fetus. It appears that as baby grows from infancy into adulthood, it expands in size but still retains ingrained embryologic rotational fascial preferences (see Figure 3). When testing for rotational fascial patterns, bodyworkers typically find the head rotates easiest to the left at the occipitoatlantal joint and right in the lumbosacral region. Due to fetal positioning, it is likely that fascial patterning does actually begin in the mother’s womb during the final trimester of birth. Moreover, individual variations in fetal lie seem to become increasingly important as the embryo’s body takes shape. Figure 4: During the normal act of walking, maternal acceleration repeatedly forced the baby’s head to translate posteriorly through a process called fetal inertia. Repeated left-sided cerebral stimulation increases neurologic activity in the baby’s vestibular (balance) apparatus. Adapted from Psychological Review by Fred Previc. 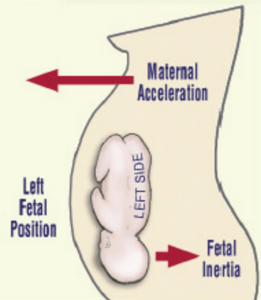 During the normal act of walking, maternal acceleration repeatedly forces the baby’s head to translate posteriorly through a process called fetal inertia (see Figure 4). Repeated left-sided cerebral stimulation increases neurologic activity in the baby’s vestibular (balance) apparatus. Prolonged left-sided inertial pressure is thought to cause increased secretion of connective tissue fibers resulting in early maturity and development of the left side of the baby’s vestibular system and subsequent right motor dominance.4 Since vestibular information travels down the ipsilateral side of the body from inner ear to the foot, when standing, most adults bear more weight on the left leg than the right. Conversely, early left-sided cranial development neurologically crosses to the opposite cerebral hemisphere (right brain) resulting in right motor dominance. Figure 5: Vestibular and Motor Dominance. Illustrated by Laura Moaske/Medimagery LLC. Reprinted with permission. When observing vestibular and motor dominance working in harmony during a normal activity such as kicking a ball, the individual typically balances on the left leg and kicks with the right (see Figure 5). In support of the cerebral lateralization premise, scientists find that in the majority of the adult population, the left leg is larger and has greater muscle mass.5 Due to this early lateralization process, an interesting postural pattern begins to emerge. 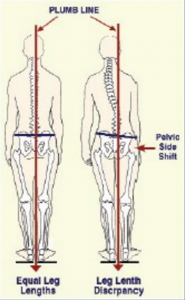 During prolonged standing, most people will sideshift body weight over the vestibularly dominant left leg causing the trunk to sway to the left. Compensatory scoliotic patterns are seen in the pelvis and torso as the body’s center of gravity shifts. Figure 6: Vestibular dominance produces left-legged weight bearing that not only flattens lumbar lordosis and posteriorly rotates the left ilium, but also causes the right ilium to drop in an anterior/inferior direction. Courtesy of Eric Dalton. Figure 7: The therapist corrects a left unilateral flexed sacrum by bracing the inferior sacral border with his left hand while the client shrugs her shoulder against the therapist’s resistance. As the client relaxes, the therapist’s left hand scoops the sacrum anterior and superior. This imbalance is a common SI joint pain generator in pregnant woman. Courtesy of Erik Dalton. The female pelvis supports the growing uterus with specialized ligaments. When pelvic bones are balanced and aligned properly, the uterus is able to enlarge symmetrically with the growing fetus. Regrettably, many women are unaware of the importance of maintaining proper structural alignment pre and post-partum and often suffer needless painful consequences (see Figure 7). If the three bones of the pelvis are pulled out of alignment due to upper or lower quadrant imbalances, proper support of the uterus is placed in jeopardy. Unequal ligamentous support can torque the uterus reducing the maximum amount of room for the developing fetus. The term used to describe this condition is intrauterine constraint. Pelvic and respiratory diaphragmatic restrictions also alter the baby’s position and can adversely affect his/her developing spine and cranium (see Figure 8). Movement limitations during pregnancy may prevent the baby from attaining the best possible position for delivery. Any birth position other than the ideal vertex, occiput anterior, left fetal lie position may produce the inhibiting effects of constraint. Such positions lead to longer more painful labors with increased chances for medical interventions. Often the mother and baby miss the many benefits of a natural vaginal birth as physicians may recommend a C-section delivery. Inadequate support in transversus abdominus, multifidus, obliques, and rectus abdominis. Lack of proper manual therapy. Poor structural alignment before, during and after delivery, i.e., presence of aberrant upper and lower crossed patterns, spread rectus abdominis muscles, pelvic obliquity, etc. Figure 8: Intrauterine constraint caused by pelvic misalignment can alter the baby’s position and adversely affect the developing spine and cranium. Adapted from Bill Allen with permission. FIgure 9: Linea alba laxity allows recti muscles to spread laterally. The resulting abdominal stretch weakness increases lumbar lordosis resulting in low-back pain. Adapted from Primal Pictures, 2003. Reprinted with permission. As the baby develops, the mother’s rectus abdominis muscles and supporting ligaments develop a great deal of extensibility (stretch). The release of a hormone called relaxin is a fundamental part of Mother Nature’s plan to assure a comfortable resting environment for the fetus and a safe normal delivery. However, a common problem occurs as the belly grows and the recti muscles begin to wander off laterally from the midline. 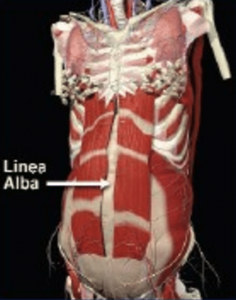 This is usually due to excessive abdominal wall pressure overstretching (or tearing) the linea alba—a tendinous median line designed to separate the two rectus muscles. When working properly, the tendon effectively binds the recti muscles close to mid-line providing optimal abdominal support (see Figure 9). Diastasis recti abdominis is the term used to describe the separation of abdominal wall musculature during some pregnancies. If mother and therapist allow this slow lateral recti migration as the abdomen expands, vital trunk stabilizers including transversus abdominis, internal/external obliques and multifidi become stretch-weakened. Gravity begins pulling the belly forward placing great strain on the low back extensor muscles. In the absence of proper front/back muscle balance, the posterior lumbar erectors tighten in an effort to restrain gravitational pull from the heavy unsupported belly. Regrettably, this only increases lumbar “bowing,” compressively loads the intervertebral discs and posterior facet joints, and creates greater low back pain. Any alteration in the mother’s abdominal support system not only adversely affects fetal positioning but also causes our pregnant mothers to cry out for help as muscles, ligaments, joint capsules, and discs loose the battle with the unrelenting force of gravity. Fortunately, mothers receiving manual therapy from trained practitioners usually experience little low back pain through their pregnancies. Specially designed sidelying techniques performed weekly or bimonthly can really help take pressure off the low back (see Figures 10 and 11). Expectant mothers experience greater trunk and low back stability as the therapist’s soft extended fingers gently hook the rectus abdominis fascia and move the tissue medially back toward the midline (see Figure 12). After a few sessions, the weakened abdominal support system “wakes up” as the recti regain muscle memory. With the recti muscles toned and back in the mid-line, the pubis and ribcage are pulled closer together which posteriorly rotates the pelvis and reciprocally reduces lumbar lordosis. Provided the pelvis is in a balanced state, the ligamentous web attaching to the uterus maintains an equalized, supportive, antigravity suspension system. Any type of pelvic imbalance that causes the ligaments to become torqued and twisted, results in uterine constraint which limits the space available for the developing baby. At the least, any compromised position the baby must endure during pregnancy can have some sort of detrimental affect on his or her optimal development. Conditions such as torticollis are not uncommon in babies suffering uterine constraint. If the shape of the woman’s uterus becomes distorted as birth approaches, the baby is prevented from getting into the best possible position for birthing. And even if the baby manages to place himself in the desirable head down position, a tight uterine cavity can prevent the baby’s head from moving into the ideal presentation for delivery. The head can become slightly tilted to one side or even more traumatically, present in the posterior position. Any fetal position that alters the baby’s correct habitus even slightly during birth will slow labor and add pain to both mother and baby. Women are often told that their babies were too big, or labor “just slowed down” when it was really the baby’s presentation interfering with the normal process and progression. Because excessive body weight tends to exaggerate ingrained aberrant postural patterns, therapists must address all soft tissues and osseous tissues (beginning with the feet) that may alter pelvic balance. Mothers with a tendency for foot pronation and valgus knees are particularly susceptible to ligamentous laxity when the relaxin hormone enters the system during the third trimester. As the woman’s weight increase and medial ankle ligaments (spring and deltoid) become lax, the already pronated talus bone continues its medial glide off the calcaneus causing the foot and arch to drop into hyperpronation. Figure 13 demonstrates a very therapeutic myoskeletal technique for bringing balance to a misaligned talocalcanea joint due to weakened ankle ligaments. Recall that ligaments like stress but do not like strain. Ankle, knee, and pelvic alignment should be assessed and corrected during each session. Home retraining exercises that focus on restoration of proper tone in the trunk stabilizers, diaphragms, and pelvic floor muscles are essential therapeutic pieces of the pregnancy puzzle. Transversus abdominis, pelvic-clock and Thera-Band toning routines boost therapeutic outcomes when performed on a regular basis between sessions. Pilates, yoga, Rolf Movement and other trunk stabilizing programs also seem effective in helping the body’s innate self-regulatory mechanisms produce a healthy happy baby. Obstetrician or midwife directed therapeutic exercises be practiced regularly for adequate abdominal and trunk stabilization support. These and other factors will not only help determine the habitus, presentation and delivery of the child, but will also play a major role in proper development and shape of the adult vertebral column. As stated above, early embryologic positioning often forms aberrant fascial rotational preferences that can become exaggerated during one’s lifetime due to life’s little micro and macro traumas. This compensatory process manifests as a loss of range of motion, tissue texture abnormalities (fascial contractures, fibrosis, etc. ), and posturally initiated pain. During the final trimester, fascial restrictions can encumber proper blood and lymph flow and create neurological interferences that travel throughout all the body’s soft tissues. Fascial distortions frequently generate pressure gradient alterations in the thoracic outlet, respiratory, and pelvic diaphragms and are major contributors to stagnation in the vascular, lymphatic, endocrine, and respiratory systems. Myoskeletal Zone Therapy incorporates special techniques for eliminating stagnation by restoring optimal diaphragmatic function. To help guarantee a successful and unremarkable delivery, the baby needs the maximum amount of space in the mother’s uterus and pelvis at exactly the time it is needed. The baby will make a very determined effort to achieve the correct position for birth, but can face resistance if a mother is unaware or unsure of her role in assisting the baby throughout the process. The third trimester of pregnancy, commencing at seven months gestational age, heralds the perinatal period. This critical stage is of greatest concern due to the propensity for adversity in the fetal presentation, position, and attitude. 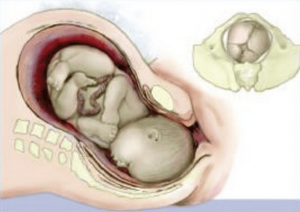 The biomechanical implications affecting fetal well-being during the third trimester, and for the preparatory phase for labor and delivery, embrace any fetal alignment other than the optimal longitudinal lie, vertex presentation, and flexion attitude. Fetal positioning during the third trimester is not only crucial to an uneventful delivery but possibly to the final construction of the baby’s posture from adolescence through adulthood. R. Louis Schultz and Rosemary Feitis, The Endless Web: Fascial Anatomy and Physical Reality (Berkeley: North Atlantic Books, 1996). J. G. Zink, “Applications of the Osteopathic Holistic Approach to Homeostasis,” American Academy of Osteopathy Yearbook, (1973): 37-47. Fred H. Previc, “General Theory Concerning the Prenatal Origins of Cerebral Lateralization in Humans,” Psychological Review 98 (July 1991): 299-334. S. R. Chhibber and I. Singh, “Asymmetry in Muscle Weight and One-sided Dominance in the Human Lower Limbs,” Journal of Anatomy 106 (1970): 553-556. Humans,” Acta Otolaryngologica 78 (1974): 399–409. B. Milojevic and J. Watson, “Vestibular Asymmetries in Right- and Left-handed People,” Acta Otolaryngologica 60 (1965): 322–330. R. J. von Baumgarten and R. Thumler, “A Model for Vestibular Function in Altered Gravitational States,” Life Sciences and Space Research 17 (1979):161-70.